Sophsterlicious • UK Blog: Liquid Liner Loving - Barry M Wink Eyeliner. I love liquid eyeliner, for me it is a must have and completes a look for me. I seem to have gotten a bit of an obsession with these felt tip pen liquid eyeliners recently, and when I saw this 'Wink Marker' from Barry M I couldn't resist.. Even though I have a couple of pen liners in my back up that are currently unopened! What can I say? I'm a makeup addict! 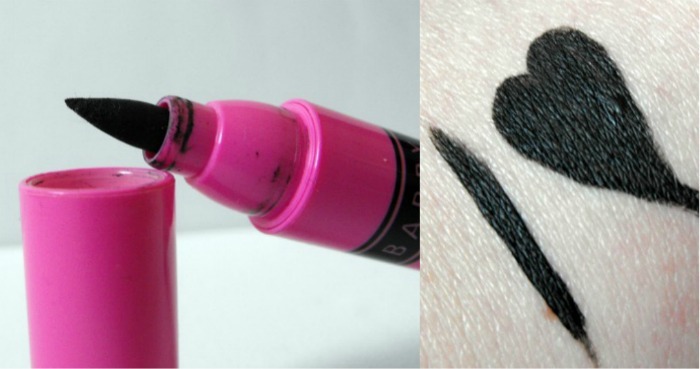 "Barry M’s Wink is a liquid eyeliner pen that is set to revolutionise your makeup routine. The thick felt tip nib enables you to achieve varying thickness by adjusting the pressure and the angle of the pen, giving you a professional look." The packaging is funky and bright, and just like a jumbo sized pen, the nib on the liner is a little bigger than I am used to but it's quite soft and the very tip has some flexibility so it's nice and easy to use. The pigmentation is very good, the liner is very black and dries quickly. It's not waterproof though, I'm used to liners that are not easy to remove, and this is.. but I don't mind that, it lasts all day on me and doesn't smudge or budge. Have you tried this eyeliner, do you like it? I give it a big thumbs up, I love it! You can buy this at Boots for £4.59. That's such a shame! I haven't had that problem atall and I've been using it for a couple of months now, then again - it's not exactly Summer!